I know I've mentioned bits and pieces about various ingredients I use in my green cleaning toolkit (here, here and here) but I thought I could put together a post on each of the main ingredients I use week-in, week-out. Hopefully this will make it easy if anyone is keen on getting into green cleaning but not entirely sure where to begin. 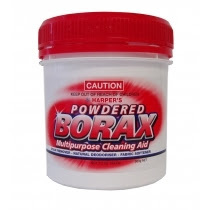 Strictly speaking, borax is a toxic substance, even though it's naturally occuring. So don't go feeding it to your pets or kids, and if using it to clean, it's recommended that you wear rubber gloves to stop any potential skin irritation. I've never had any issues with it, and it sure as hell is better than the highly toxic commercial cleaners you often find at the supermarket. Toilet Cleaner - I sprinkle the wet toilet bowl with a handful of borax, then saturate the borax with a good spray of straight white vinegar. I also spray the whole toilet with straight vinegar at the same time, to clean and disinfect. Leave it to sit for 15 minutes or more. Wipe over the toilet with a damp cloth and then dry with an old teatowel and then, using a toilet brush or a cloth, scrub the bowl and flush. Easy! Tile Scrub/Shower Cleaner - I do this once every few weeks and it seems to get rid of any mould in the shower and stop a lot of it from growing back. Just mix roughly equal parts of borax and straight white vinegar in a tub. You're looking for a watery paste type consistency. Then using a damp cloth just spread the mixture over the tiles in your shower (walls and floor, concentrating a little more on the grout) and leave. 15 minutes plus is fine, and over night would do no harm. Then wipe down/scrub with a damp cloth, rinse and wipe over with a clean, dry cloth. Disinfectant - A couple of tablespoons of borax in some warm water is a great disinfectant for bins etc. Just wipe over with the mixture and then rinse with clean water. Laundry Booster - You can add a sprinkle of borax to every wash and it will help whiten your whites and remove soap build-up and odour build-up in your clothes. I personally don't use it in every wash, but have found it does help soften blankets and linen. Ant/Cockroach Control - Borax can help to get rid of ants and cockroaches. To get rid of cockroaches try sprinkling the areas most likely frequented by the little buggers (be careful if you have kids or pets though). The borax attaches to their feet as they crawl over it and will eventually be ingested. For ants you can mix some borax with honey or sugar syrup and put it in some upturned jar lids. The ants will be attracted to the sweetness and then take the borax back to the nest with them. I'm sure there's more tips out there, but they're the ways I've used borax. It's probably the least friendly of the ingredients I use, so it was nice to get that one out of the way! Maybe next time you go shopping, pick up a tub of borax (it's super cheap, in the laundry/cleaning aisle at the supermarket) and add it to your green cleaning toolkit. Dare ya!